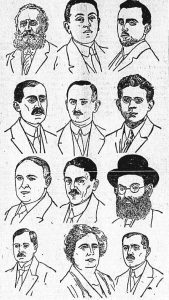 In this drawing of the Jewish representatives to the Sejm, Moshe Deutscher is in the black hat. Senator Rabbi Moshe (Mojzesz) Deutscher (1880-1941) was born to a family of Gerer Hasidim in Kraków who ran the city’s foremost printing press. He was one of the first to appreciate the necessity of a political organization for world Orthodoxy, joining the efforts to found the Agudath Israel in Katowice in 1912 and cofounded the Agudah branch in Kraków at the end of the First World War. He remained both a fervent Gerer Hasid and a devoted Agudah activist, attending all three World Congresses in the interwar period, for his entire life. In 1922, he was elected Senator to the Polish Sejm (Parliament), representing the Agudah party in the National Minorities Bloc organized by Isaac Greenbaum, which included Jews, Ukrainians, Germans, Czechs, and other minorities. In addition to his work in the Sejm, which required a weekly commute between Warsaw and his hometown of Kraków, the Agudah also called on him to manage their struggling daily newspaper, Der Yud, which he did from the family printing press (but which continued to run a large deficit). In 1928, when the coalition dissolved–and even the Jewish alliances failed–Deutscher lost his seat and returned to his family and business in Kraków, while continuing to work on local Agudah initiatives. It was in that capacity that he turned his attention to Bais Yaakov, which he saw as the peak of Agudah’s accomplishments in Poland. In the next decade, he worked alongside Rabbi Asher Spira, Rabbi Meir Heitner, and others to secure funding and support for the Teachers’ Seminary in Kraków. In 1936, Deutscher was operated on for a throat injury in Vienna, and almost completely lost his voice after that. He died in Kraków in 1941, not at the hands of the Nazis but of his throat disease; his peers considered it fortunate that he was spared the sight of the worst devastation, and was even buried in the Land of Israel. For more, see: Hillel Seidman, Ishim she-hikarti [Personalities I Knew], Jerusalem, 1970, 400-405.